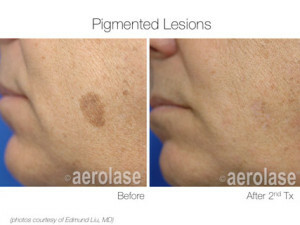 We use a variety of lasers to treat pigmented lesions. Whether we’re using a 532nm KTP or a 755nm Alexandrite laser, rest assured we do our best to ensure your brown spots are targeted and removed safely leaving your skin as smooth and bright as it once was. If all else fails, we have the option to use a unique MicroPulse-1064 laser. 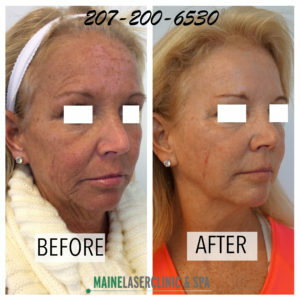 Now you can safely and effectively use the 1064nm laser modality to remove pigmented conditions including sun & age spots, Melasma and post-inflammatory hyper pigmentation. Historically, Nd:YAG 1064nm lasers have not been used for the removal of hyperpigmented skin conditions such as sun & age spots, Melasma and PIH (post-inflammatory hyperpigmentation). This is because melanin absorption is relatively low with the 1064nm wavelength. But a new generation of 1064 laser technology, contained within our laser provides much more effective and rapid heating of hyperpigmentation, delivering treatment efficacy equivalent to laser modalities used previously such as Alexandrite or Diode. This is made possible by MicroPulse-1064™ technology, which provides over 15,000 watts per pulse in unique pulse durations of 0.65msec. How we treat "brown spots"
Many patients are amazed that lasers are so effective at breaking up hyperpigmentation, yet our lasers are also uniquely safe and gentle on darker skin types for applications like Skin Rejuvenation and Hair Reduction. That is because the fluences required for these applications are generally low due to the rich melanin concentration in the hair follicles in patients with skin of color, and the correspondingly high absorption of energy. Furthermore the MicroPulse-1064™ technology of our laser enables the skin to cool itself between pulses, such that skin cooling during treatment is not even necessary. Will I require more than one treatments? Improvement may be seen after a single treatment. The maximum is 1-3 treatment sessions. Treatment times vary depending on the amount and size of lesion. Minimal discomfort should be expected. We utilize a cooling device to offset the energy produced by the laser. What Preparations do I have to Make prior to treatment? Clients do not have to change their daily regime. We suggest avoiding sun exposure on the area to be treated prior and post treatment. What are the side effects - What can I expect after treatment? No sweat. Post-operative care is minimal. This is a non invasive treatment. No injections. No surgery. Redness, swelling and mild bruising can occur, but most always resolve over time. Avoiding sun exposure to the treated area and physical activity should be avoided 24-48 hours after treatment to minimize the risk of any possible complications.